Think of an incentive that could push Lewis Hamilton to keep up his winning stride. 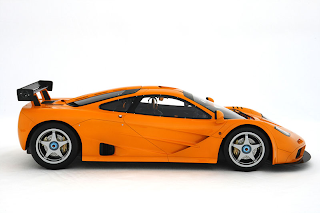 If you could think of an incentive worth $4 million, you have to think of the McLaren F1 LM, being promised by McLaren CEO Ron Dennis for winning two Formula One World Championship titles. 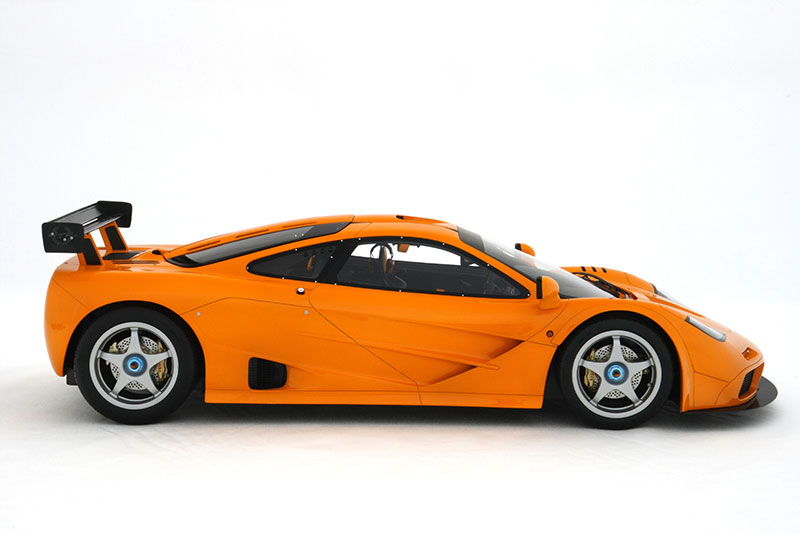 However, we could dwell on this forever what it is like to squeeze in the finest driving machine ever built for the public roads, but UK-based Amalgam Fine Collection sells what has to be one of the most detailed model collectible cars of this 1/8th scale McLaren F1 LM. The engine cover can be opened, showing off the intricate detailing on this stunning model and its hard to believe if this is actually a model. It is accompanied by the book “Driving Ambition” written by Doug Nye in conjunction with Ron Dennis and Gordon Murray, telling the whole story from conception to realization of this iconic car. Priced at $5,300, Gordon Murray will sign the book, along with the certificate of authenticity that accompanies each model. Billy Mack crooned “I feel it in my fingers, I feel it in my toes. Christmas is all around me, and so the feeling grows.” Yes, the feeling is growing every single day as Christmas is just around the corner. Ladies and gentlemen, it is time to forget the depressing economic climate and uncork the bubbly to usher in the festive spirit of Christmas. What better way to do it than indulge in some good old retail therapy? Talking of which, the rich and famous will love this list. 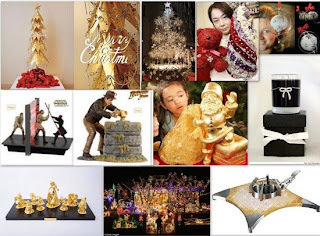 We bring you 10 hyper expensive Christmas decorations which will guarantee wao if not yelps and hoots, from onlookers. Let the festivities begin. It’s not a new thing for products to catch your eye when they are Ferrari inspired. 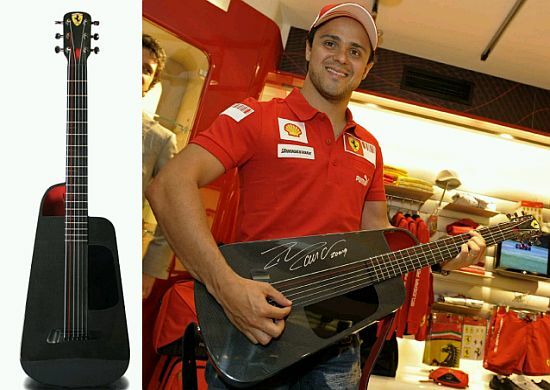 The new in the list is Blackbird Guitars that brings to you the limited edition Ferrari branded “Rider.” Signed by F1 drivers Philipe Massa and Kimi Raikkonen, the ultra-rare Ferrari Blackbird guitars are the most durable and lightest travel guitars in the world. Deriving its sleek look from Ferrari itself, the guitar is made from the black carbon fiber and high tech materials, along with the exclusive Maranello Red interior, accented red A string, and on top of it a Ferrari emblem to inspire the most passionate of the clients. While thislimited edition is no longer available and is being sold at Ferrari stores in Europe, but they are accepting special, custom orders on the Rider model. Celebrating the passion of world-class Italian motoring, the Rider guitar starts at $1,499, but there’s no info on what customization will cost. A distinguished heritage of Aston Martin coupled with exceptional design has made Aston Martin DBR1/2 Essence of Form Cufflinks. The cufflinks, which depict the iconic 1950’s DBR1 sports racing car, are crafted using actual original redundant aluminum body panel pieces from DBR1/2 as ‘donor’ metal. 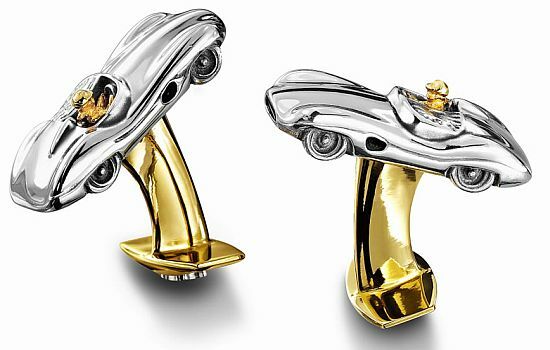 Inspired by the same commitment to elegance and style of Aston Martin two editions of these very exclusive DBR1/2 cufflinks are to be issued featuring different sculpted depictions of the car. Priced at $4000 and limited to just 50 pairs, both editions will accompany certificates signed personally by Carroll Shelby. The collection is definitely an exclusive range of fashion accessory that will add style and sophistication to any formal outfit. Classic Recreations’ skilled craftsmanship for over 10 years of modifying and custom fabricating high-performance vehicles has finally paid back. 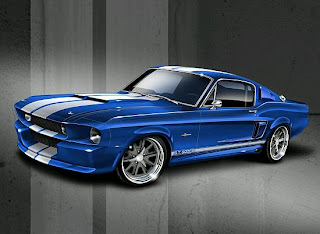 Carroll Shelby has granted Classic Recreations the license to build the official Shelby GT 500CR. Announced on the opening day of the annual SEMA Show in Las Vegas, the G.T.500CR will be offered in three models - The “Intro,” the “Performance” and the “Venom” models. The preliminary technical details and package specifications for the G.T.500CR, a 1967 Shelby continuation vehicle, will feature a hand-built 427 cubic inch (7.0L) engine, model specific bodywork, custom paint, hand-stitched upholstery and every car will have an official Shelby serial number and badges along with the official Shelby Worldwide Registry. This thrilling opportunity to grab a Mustang while retaining the iconic Shelby elements, it just can’t be better than this.